You know in horror films when you think the big baddy has been vanquished but then he reappears and needs tackling one last time? That’s how I feel about decluttering my clothes. I had performed the initial decluttering, storing and discarding of my clothes before the summer holidays and had then taken an enforced break from my minimalist journey while I was away for the summer. My minimalist sabbatical had then continued while I let writing the blog catch up with where I was at in real life. This obviously took awhile because, let’s face it, those blog posts aren’t exactly short. It’s lucky Marie Kondo doesn’t have anything to say about minimising one’s writing otherwise I’d be in serious trouble. I was aware that I was breaking two of the cardinal sins of blogging (gleaned from a blogging seminar I’d attended) – only write short posts and update your blog weekly at the very least. I was failing on both these counts. Short has never been in my writing repertoire and the long hours of teaching were severely hampering my ability to rustle up timely posts. But those rules are designed for people who are aiming to grow a readership and hopefully monetise their blogs. As for me, I’m doing it because….well, I’m not entirely sure what my aim is other than to do some writing. Writing is something I’ve loved to do since childhood but as an adult I’ve never managed to find the time to do it or a topic I wanted to write about. Documenting my journey into minimalism has, at long last, provided a much-needed framework that I can pin my writing to. A friend commented that if I’m not bothered about growing a readership why don’t I just write a personal diary? I guess I like writing in a public space so that my friends can see what I’m up to and maybe someone out there, in the tundra of the internet, might also be inspired to try minimalism on for size. Trying to get my blog to catch up with where I was in real life reminded me of trying to keep a travel journal in South America. That journal had been three months behind where I was in reality. I hadn’t made things easy for myself by not writing anything for the first week we were there, claiming I was waiting to be visited by the elusive muse, and then, when the elusive muse finally showed up, I insisted on writing 18 A4 pages about the very first day of travelling – a day that could have been summed up with the sentence “We flew to South America at 10pm”. It all went down hill from there and I was left playing journal catch up for the duration of the trip. Writing a lot has been a predisposition of mine since primary school. Whenever we had to write stories, I never finished mine because, while all the other children were rounding off with the classic narrative device of “And then I woke up and it was all a dream”, I hadn’t even reached the initial disruption to the equilibrium. I doubted the other children’s commitment to nuanced characterisation, an engaging narrative and richly detailed description. This trait of writing a lot is clearly alive and kicking seeing as my last blog post was 4,660 words and could basically be boiled down to “And then I took some clothes to the charity shop”. I think my blog posts should get shorter as I write about some of the other categories. When I get to sentimental items that one will probably be a biggie, but surely I can’t have that much to say about things like electrical items and kitchenware? But I might surprise myself so it’s best I don’t make too many promises on that front. 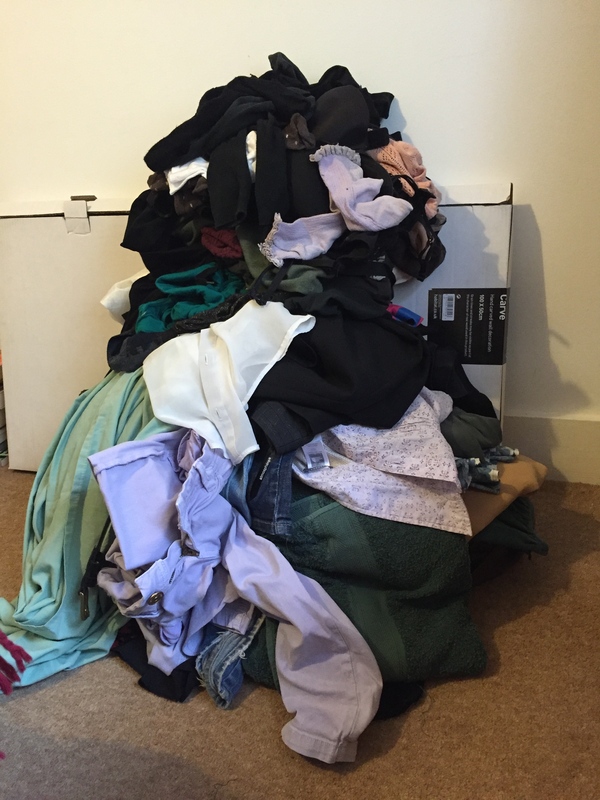 As I blogged and reflected upon the decluttering process so far it became increasingly obvious that the clothes behemoth had been weakened but not fully slain. Keep reducing until something clicks, Kondo says. Reduce your possessions until you feel like a switch has been flicked and a sense of satisfaction envelopes you. This is when you know you’ve hit your own personal “just right click point” – this is the amount of possessions you need to live happily. This click point differs for everyone and depends on your own personal tastes for what brings you joy – if you love handbags maybe you need 100 whereas someone else will only require two, if you love books maybe you need a whole wall, or even a room, dedicated to them. Whatever your own personal measure, when you reach the click point you will feel it with a visceral, palpable sense of knowing. I wasn’t there yet with my clothes. I still had more work to do. This is fine, says Kondo, if you still need to reduce then do so with confidence. For a start there were the summer clothes that I had given one last season in which to prove their worth. As autumn became an inescapable reality, I knew it was time to sound the death knell on those items. In addition to these, there were the clothes I’d kept thinking I might take them on my holiday to dance camp but ultimately they hadn’t made the cut. And then there was my sock drawer…it’s neatly folded glory had been short lived. And this was for the simple fact that I still had too many pairs of socks. Everything must have a designated spot, Kondo warns, otherwise rebound clutter will surely follow. This I experienced first hand – without their own space to neatly slip into, the surplus socks had had to sit on top of the others eventually causing a degeneration of the neatly ordered lines. More needed to go. With these blacklisted items in mind, I took the plunge and tackled my wardrobes and drawers once more. This time I didn’t go through the whole rigmarole of getting every single item of clothing out first and putting it all on the bed. I do think this is a crucial step to do initially but having done it all once, I decided to go for each section of clothes individually this time. First up was my big wardrobe. Out came its contents. I quickly amassed a new discard pile. On it went the summer clothes that had not been worn all summer and the ones that had been kept as potentials for dance camp – these had been clothes that I knew brought me no real joy but I’d thought they might be useful for wearing to the dance classes. Yet their joylessness had been so pervasive that it meant they were overlooked when packing for camp. Apart from these clothes that I’d been eyeing up with my beady discarding eye there was a sizeable number of other items that ended up on the pile that took me somewhat by surprise. These were clothes that had survived the initial decluttering stage but with everything else gone, suddenly the spotlight was shone upon them and it became clear that this time they wouldn’t be so lucky. Rather than being revered ancient artefacts, these clothes were all from the recent past – mostly from within the last five years. Maybe you wouldn’t count clothes that are five years old as recent but considering I had had some things from twenty years ago, five years is a mere blip in the timeframe of my wardrobes. Being newish had meant they had been given clemency in the initial round of decluttering. The sheer volume of what I had been discarding had been quite overwhelming and guilt inducing. This had combined with the fear of discarding too much and being left with nothing and with the fear that I would discard things and then be racked with crushing regret. Thus I’d erred on the side of caution. But I’d always known I was keeping things that didn’t truly speak to my heart. That first round had been epic, immense and quite traumatic but now, a couple of months down the line, I knew that I had nothing to fear. Out of the colossal pile I had discarded previously there was only one thing that I regretted getting rid of. A brown woollen cardigan with elbow patches – quintessential teacher-chic. It had not exactly bought me joy (hence it ending up being ferried to The British Heart Foundation) but it had gone with the green trousers I wear to work and now I realised none of my other cardigans really went with them. Kondo says this is par for the course – that you can expect to regret discarding something at least three times during the tidying process. But this is not to be fretted over – Kondo has found that even though people may regret discarding something they never complain or moan about it. This is because they have learnt that all that is needed is action – a lack of something can be resolved through being proactive and seeking a solution. I had imagined that any regret I would experience at mistakenly discarding something would be felt with such a painful force of lament and woe that I would sink to my knees, shake my fists at the sky and howl “Why, God? Why? Why did I throw that out? !” But Kondo was right. The regret was felt more as an impartial observation. It was more “Oh, I appear to regret the decision to discard that. I will endeavour to find a new cardigan that will go with those green trousers. And maybe I could find a more chic, fashionable one this time.” Knowing that I had nothing to fear from the regret was a massive relief. I have a tendency to torture myself over missed opportunities or unwise decisions, rerunning situations in my head ad nauseam, trying to find the one key moment that triggered my lapse in judgement, obsessively seeking to identify where it all went wrong and then imaging a different response, a different chain of events. It’s as if by conjuring the situation again so vividly, I could almost change the past. But no matter how ardently I replay this new sequence of actions the present always remains steadfastly and perniciously unchanged. In contrast to this it was liberating to be able to give a shrug of my shoulders and say “Oh well”. I hoped this sanguine attitude to regret would continue. Kondo claims that this is an inevitable result of the tidying process – we hone our decision making skills, learn to take responsibility for our actions and discover how to implement proactive responses to problems – thus we experience a lasting change to our mindset. So apart from the brown cardigan, I did not miss or yearn for any of the items I had discarded. Not only did I not miss them but I barely even remembered what I had disposed of. It was definitely a case of out of sight, out of mind. And as for the items I did remember, I now wondered why I had kept them for so long in the first place and why I had been so upset about getting rid of them. Life was better, more streamlined, without them cluttering up my peripheral vision. With this new “no regrets” attitude, I set about tackling the remaining clothes. Casting a critical eye over my wardrobe, I realised that there were many of these newish clothes that I just hadn’t worn in a long time. I discarded a couple of skirts that I’d bought because they were on sale but which had never quite fitted right or went with anything else I owned. Adding them to the pile I thanked them for teaching me not to be sucked in by sale items in the future. Also onto the pile went a number of things that had been saved initially because I had thought that I genuinely liked them. But when I tried them on this time, I realised, to my surprise, that they didn’t even look that good. And then there were a number of clothes that had been worn in the recent past but that suddenly struck me as much too girlish. A slim frame and a youthful appearance (people often think I’m younger than I am) has meant I could get away with wearing outfits commonly worn by younger women. I’ve never felt my age and although I think a lot of people feel younger than they are, I’ve never been what you could call mature. I was a late developer at school and this sense of feeling and looking younger than my peers has never left me. But recently I’ve been starting to feel the weight of my true age. This isn’t necessarily a bad thing, it’s just different. I’ve always felt young and now I don’t. And suddenly so many things in my wardrobe, even things I’d worn eagerly just last year, seemed much too young for my 37 years. The words “you’re almost 40” rang in my head as I observed myself in the mirror in a variety of cute little outfits. The impending milestone of 40 brings me no trepidation (I’ve never minded getting older, possibly because I’ve never felt or looked my age, plus it is undeniably pleasing when people register such surprise at finding out how old I am) but approaching this age does bring an awareness of a shift in one’s being. Forty has been given an inescapable cultural significance in our society. Being slim may have bought me a few more years of wearing short little outfits but I’m well aware that a sell by date is fast approaching. Slim legs or not, no one wants to be mutton dressed as lamb. So I bid farewell to a variety of items (short skirts, little shorts, playsuits and girlish dresses) that created the illusion of a younger woman starring back from the mirror and I contemplated attending some sort of workshop to tell me how a woman in her late thirties should dress. Also culled from the wardrobe were a few pairs of shoes. One was an expensive pair of high heels that I’d only worn twice, primarily because I hate wearing heels. They had survived the initial cull because I wasn’t quite ready to admit to myself what an expensive mistake they’d been. I was still trying to kid myself that I might get some wear out of them. But every time I saw them I’d feel a twinge of guilt and annoyance that I’d paid so much for such an unwise purchase. It was a relief to just admit my mistake, accept the fact that the money was long gone never to be recouped, and send them on their way, hopefully where they would meet someone who would actually wear and enjoy them rather than resent their existence. Added to these were a pair of boots that I’d absolutely loved and had worn to the point where they needed to be resoled. But the new soles were unnervingly slippery and attaching them had somehow made the boots a little tighter than before. I think I’d only worn them once since having them resoled. It was time to admit that their purpose had been to be worn until their original soles gave out – trying to keep them alive with the life-support of new soles meant they were just clinging on in an unloved limbo at the back of the wardrobe. Then there were the black sparkly jelly shoes. Discarding these caught me completely off guard. I’d picked them up to stow them safely back in the wardrobe but as I held them I suddenly realised they didn’t bring me any joy. I’d thought they were pretty rad and had got plenty of wear out of them last year but now, suddenly, they seemed emblematic of the youthful clothes that no longer matched my age – the clothes that maybe did me no favours style wise and were reflecting and reinforcing an eternal Peter Pan-like youth. Had I been wearing these clothes because they looked good (had they looked good? I think they did), because they were a way of keeping my youth alive (surely not?! ), because I just didn’t know what else to wear or because I genuinely liked them? I had liked those jelly shoes, I reminded myself, I’d thought they looked cool. But why did I think they looked cool? Once again I vowed to educate myself about fashion and clothing once the primary decluttering phase was complete. With the shoes and clothes in my wardrobe now pruned and neatly categorised again, I turned my attention to the top shelf in the wardrobe which held towels and bedlinen. These hadn’t been included in the initial cull as I had focused it only on clothes but this time I wanted the whole wardrobe to be decluttered. I discarded an unnecessary spare towel, a fitted sheet with such elderly wilted elastic that it had practically turned into a flat sheet, and a green towel that I had bought on my very first backpacking trip fifteen years ago. I remembered standing in a shop in Argentina, holding it round me to see if it would adequately cover my modesty. It was a little threadbare now and certainly no match for my fluffy John Lewis towels when it came to comfort and absorbency. I’d kept it all these years as a form of remembrance and loyalty for the fact it had taken that first seminal journey with me. I gave it heartfelt thanks for all it had done for me at the time and added it to the collection heading to H&M’s recycling scheme. Now that the whole wardrobe had been decluttered and tidied, it felt great. It contained probably less than a third of what had originally been in there but finally every single item within in it was something that I would actually like to wear or use. I then revisited my drawers and undertook some further decluttering there. I discarded a couple of old pairs of jeans from the days when low rise trousers had been fashionable. I probably should have got rid of them first time round but I had thought that I liked them. However trying them on this time made it abundantly clear that they needed to go. I marvelled at how fashions changed – they were so low rise it looked like half of them was missing and they barely even covered the essentials. Then I got to my underwear drawers again. This included an entire changing of the guard for my bra collection. After the initial cull I had bought a new batch of bras and there’s nothing like wearing a new bra to highlight the sorry state of the old ones. Oh, so this is how supportive the elastic is supposed to feel! It was out with the old and in with the new. Also discarded was a bunch of socks worn thin at the heel – again these should probably have gone in the first cull but I had quailed at the amount of underwear being disposed of. But with these gone now all my remaining socks could easily fit into the shoe boxes, they all had a space to live, meaning it would no longer be difficult to maintain law and order amongst the ranks. In the last decluttering I had saved a collection of little t-shirts with pictures of Hindu gods on. I had bought these on my first trip to India and had told myself that they definitely brought me joy and I might totally still wear them. But they had not been worn and I had to be honest with myself that they didn’t fit particularly well and that I’d only kept them because I’m deeply attached to anything from that first kaleidoscopic, intoxicating visit to India. Three of the four tops were added to the discard pile (after I’d taken photos of them) and one, the first one I bought, was added to my Special Saved Items collection. Having made peace with the fact I’d chosen to keep the Pulp t-shirt, the Birmingham Uni top, and the clubbing clothes and having justified this with the beautiful symmetry of each item representing a phase of my life, it was no great leap to add the Shiva t-shirt to the collection – it could be the one saved article to represent my travelling years. Whereas there had been much hand wringing and anguish over the decisions to save the other items, having reconciled myself to the fact I hadn’t been able to entirely throw off the sentimental shackles of the past, the t-shirt was cheerfully added to the collection with a shrug and an acquiescent smile at the recognition of my own weaknesses. I wondered whether having this little collection made me a bad minimalist in much the same way as I wonder whether my love of makeup makes me a bad feminist. It was something to ponder even though I know the answer is that everyone chooses their own path through the principles of both minimalism and feminism. As I was stowing away my Special Saved Items collection I stumbled upon the one non-dorky hat I’d kept. I’d always been going to keep my dorky travelling hat but it had seemed such a bold move to get rid of all the other hats I owned. Sure the novelty ones could go but there had been several that were nice and that I considered I looked quite cute in. So I’d saved one “just in case”. But then, it would seem, I’d promptly forgotten I’d saved it! In my head I remembered getting rid of all my hats except the travelling one. Clearly “looking cute” and “just in case” are poor reasons to keep an item. I had already been informed of this through the writings of Kondo and The Minimalists but I guess sometimes we need to learn from our own experiences. But now it was decision made – it went straight on the discard pile. If I’d thought I’d culled it and not missed it at all then it was time to say a real goodbye this time. Then I paused over a pretty skirt, twirling in the mirror, thinking to myself it was such a shame to get rid of it as it would be perfect for a garden party. Maybe I should just hold on to it…Then I remembered I’ve never been to a garden party in my life. And suddenly the fantasy in my head where I was wearing the skirt, standing on an immaculate lawn, holding a glass of something sparkling and engaged in witty conversation dissolved before my eyes. It reminded me of the scene in Labyrinth where the junk yard woman tries to distract Sarah from her mission by giving Sarah her toys and possessions. It’s only when Sarah realises they’re meaningless and declares it all to be junk that she manages to break free. I added the skirt to the pile promising myself that if I ever attend a garden party I’ll buy myself something lovely. It’s amazing how one’s brain can concoct all sorts of baseless reasons why we should cling on to things we don’t need. It’s almost like your brain is worried that without all these material things, these accoutrements of life, anchoring you to the earth, you’ll float away as an ephemeral wisp. But, according to minimalists, it is this sense of lightness and freedom that we should be striving for. We can achieve this liberation, we just need to reassure our brains that we will continue to exist and flourish without previous purchases and collected, curated possessions to prop up our sense of self. Freed from the undercurrent of the continuous desire to consume we can focus our time, money and energy on other activities and pursuits. I took the bags containing the second discard pile to The British Heart Foundation and this time I handed them over with a smile.